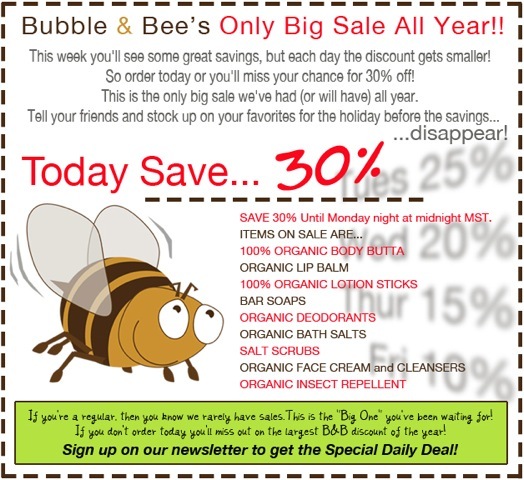 Freckles to Toes: Bubble and Bee One Day Sale! Okay, it's not quite a one day sale. The savings are the best today (30% off), and go down 5% every day until Friday, when deals end at 10%. If you're familiar with Bubble and Bee, you know that sales are few and far between. That means you gotta jump on this! You don't need any promo code, or special link. All discounts are available to everyone online at Bubble and Bee. The sale is pretty exciting: even their special blend deodorants and gift bags and baskets are on sale. After all, it's just about the time to begin that holiday shopping. Also, if you spend more than $99 you get free shipping! So grab some friends and place a big order together. Wanna know what I'm going to snag? I'll be stocking up on some coconut and lime lip balm (to satisfy my addiction). I've also been eyeing the coffee vanilla soap, and now might be the perfect time to sample it. I'd get to wake up to the scent of fresh coffee without grinding any beans! I know, right?! Utah was a surprise for me too. And the name of the town they're in is "Bountiful." Isn't that just too perfect?